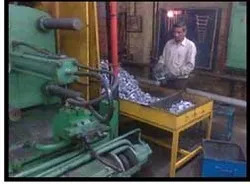 We, Indian Diecasting Industries, incepted in the year 1964, at Aligarh, Uttar Pradesh, are one of the leading manufacturers of a superior range of Aluminium Die Cast Components, Zinc Die Cast Components, Die Casting Moulds etc. Our range is fabricated using best grade raw materials, which are sourced from certified vendors in the market. These are available in various specifications, which can also be customized as per the requirement of our clients. Our range is well known for high performance and durability. 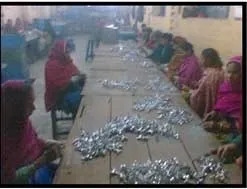 Our organization is supported by a well-developed infrastructure facility, which is segregated into various units such as manufacturing unit, warehousing, and packaging unit and in-house quality testing unit. These units are managed by a team of highly experienced professionals who enable us to offer unmatched range of products to our clients with high accuracy results. Furthermore, our aim is to offer quality products to our clients. Under the inspiring guidance of our Anshuman Kumar Aggarwal (Managing Partner) we have carved a niche for ourselves in the competitive market. He has vast experience in this domain and assists us to offer quality products to our clients at competitive prices. Moreover, owing to our easy payment modes and client centric approach, we have gained a huge clientele across the globe. We employ a state-of-the-art infrastructural facility equipped with latest machines to design and manufacture our products. 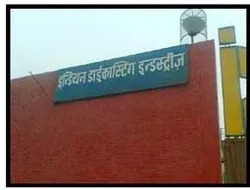 We have segregated our infrastructural facility into various divisions so as to fasten the process of execution. We have best of the equipment that make our products stand apart from what is available in the market. Our advanced machines are in sync with best available technology and that is why our products are of supreme quality and widely known for their durability. Our dedicated approach and customer centric operations have enabled us to offer our clients with superior quality die components. Through our efficient and prompt delivery schedule, we have served a wide client base across the globe. We manufacture a wide range of products for our clients. We are thoroughly dedicated to serve the satisfaction of our clients and that is why we check the whole range of the products to be offered on various parameters and ensure a defect-free range of products. Driven by a team of experienced and dedicated professionals, we have accomplished in attaining the maximum trust of our valued customers. After carrying out survey of hundreds of diecasting units in India. 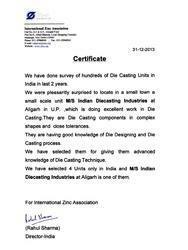 International Zinc Association has recently selected our company among 4 Units in India under United Nation-Common Fund for Commodities Project and world renowned die casting expert Mr Joseph Annets of Australia has already imparted us advanced knowledge of Die Casting Techniques sparing many days at our plant. We are committed to offer our customers the best in class products and for that purpose we have carved out a renowned place in the market. We are backed by a sound infrastructural facility and an efficient team that aids us in making a qualitative range of products. We also assure the cost-effectiveness of the whole range of the products offered.